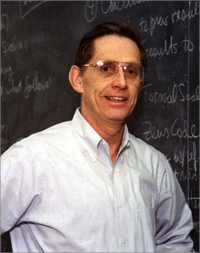 Jeremiah Sullivan was Emeritus Professor of Physics at University of Illinois, Urbana-Champaign (2006-2016). His research interests included high-energy electromagnetic interactions and hadron-hadron processes at high energies. He was also interested in civilian and military uses of space, safe and secure dismantlement of nuclear weapons and disposition of fissile materials, technologies for enhancing the effectiveness of peace operations, arms control verification, and science and public policy. 1960Obtained BS, Carnegie Institute of Technology, Pittsburgh (Pa.). 1964 – 1967Research Associate, Stanford Linear Accelerator Center (SLAC). 1967 – presentActing Assistant Professor of Physics (1967); Assistant Professor of Physics (1967-1969); Associate Professor of Physics (1969-1973); Assistant Professor to Associate Professor, Loomis Laboratory of Physics (1967-1973); Professor of Physics (1973-2006); Head, Department of Physics (1999-2006); and Emeritus Professor of Physics (2006-2016), University of Illinois, Urbana-Champaign, Urbana (Ill.). 1974 – 2016Member, JASON Study Group. PhD advisor at Princeton University, "The Vacuum Regge Trajectory in Scalar-Vector Field Theory."